It was all change for Doctor Who Series 5. Stephen Moffat had taken over as the show's head and lead writer from Russell T. Davies, with a new production team. Matt Smith had taken over from David Tennant, and he certainly hit the ground running, and quickly picked up a new set of companions. Thankfully Murray Gold is still the show's composer with his own team of orchestrator/conductor Ben Foster and the BBC National Orchestra of Wales. However, although the music is still in Gold's inimitable Who style, it has changed too. The title theme has also regenerated and Gold has thrown away the old set of recurring themes and brought in new material for Matt Smith's decidedly different take on the Doctor. It's great to see this release again on 2 CDs just like "Series 4 The Specials" which preceeded it. The new theme is heard in track 1 "Doctor Who XI". I wasn't sure about the new arrangement initially - it sounded both speeded up and dumbed down, but it has grown on me over time. However all the other new music for Matt Smith is instantly likeable. "Down to Earth" is the action sequence with the tardis spinning out of control over London before eventually crashing into a garden. "Little Amy" and "Little Amy: The Apple" introduce one of the new themes for Amy in a delicate arrangement, and this theme stays even when little Amelia becomes the fiesty grown up Amy. "Fish Custard" is the gently comedic music which introduces the mad Doctor and his hunger - still confused after his regeneration or will he always be like this? The stand-out new theme is "I Am the Doctor" though it is hinted at earlier in "The Sun's Gone Wibbly" and returns again in "Amy in the Tardis". The main section has a distinctive 7 beats in the bar but it has numerous variations and counter themes, plus associated material with a more-traditional 4 beats in a bar. This group of melodic ideas are a great invention by Gold - they give things a propulsive force, and can be used and adapted in various ways for different episodes and trailers. Marvellous! Episode 1 was clearly very important to establish the new Doctor and companions. It introduces a lot of new musical material too, and it is entirely fitting that it should occupy 10 tracks of CD1. It is a great mixture of the boisterous and the magical. It sums up the Doctor and the overall programme, setting the standard for the rest of the Series. The story "The Beast Below" has an interesting mix of styles, with a great version of "Amy's Theme" and the gently romantic "A Lonely Decision" as the Doctor prepares for a "needs of the many outweigh the needs of the one" moment. I like the way "Victory of the Daleks" builds and modulates as the scale of the menace becomes clearer, and then "Battle in the Sky" starts as a March and turns into a victorious anthem for the preposterous but fun sequence where The Battle of Britain is recreated in Space. The 2 episodes where the Weeping Angels return are only represented by 2 tracks, but "The Time of Angels" features some great detuned electronic effects and sudden frightening sounds for the scary scenes in the dark cave. "I Offer You My Daughter" and "The Vampires of Venice" use a simple 3/4 theme with a stately rennaisance feel. Murray Gold has another simple tune on flute and guitar in "Amy's Choice" but disturbingly there is a clock ticking in the background, and the weirdness continues in "This is a Dream" with bending brass and reverse electronic effects (but not the twittering bird sounds heard in the episode itself). There is tense action and great orchestration for "The Silurians" which concludes CD1. We then have a distinct change of pace for the story "Vincent and the Doctor" and most especially the track "With Love, Vincent" where the artist is able to see that his work becomes a major success after his death. This moving sequence starts off so gently and grows into a hypnotic refrain. The mood changes again for "The Lodger" which is a lot of fun e.g. "Doctor Gastronomy". The remaining 22 tracks are reserved for the outstanding 2-part finale of the series "The Pandorica Opens" and "The Big Bang". This brings together multiple threads from the earlier episodes. One of Murray Gold's great skills is to be able to "turn on a dime" and change mood very quickly through quick scene changes and mood changes, and this skill is very much needed for this complex but ultimately extremely satisfying storyline. It concludes (or almost concludes) plot elements originating in "The Eleventh Hour" and various strands developing throughout the series. Musically Murray Gold has much outstanding music for the whole episode, and brings back initially distorted versions of the new themes. There are big set pieces like "Words Win Wars" and unashamedly cartoonish tracks like "The Same Sonic", but the balance lies towards some light and very touching tracks like "The Life and Death of Amy Pond", "Amy's Starless Life" and "The Patient Centurion" where an Auton version of Rory guards Amy within the Pandorica. The most moving moments of all come as the Doctor recedes into his own past but manages to plant a thought in the mind of a sleeping Amelia in "You and Me, Amy", only for this seed to awaken during Amy's wedding reception "I Remember You". The final track "Onwards!" sounds like a tap-dancing version of the main 11th Doctor theme and ends abruptly - no doubt "to be continued...". 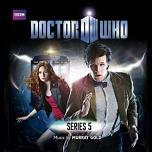 All Murray Gold's Doctor Who CDs have been great but "Series 5" is truly outstanding. It is available from these links at: Amazon.com and Amazon.co.uk.